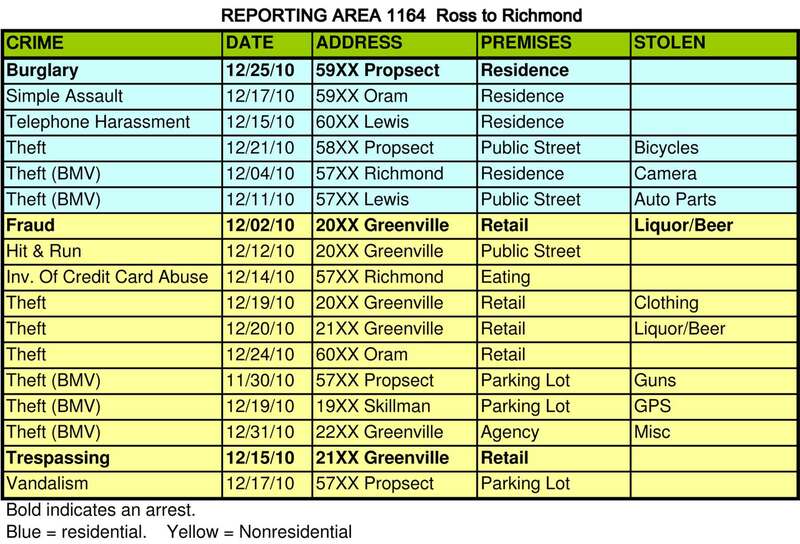 December crime stats are in and we mostly had another good month. We are down on total incidents and residentials thefts. 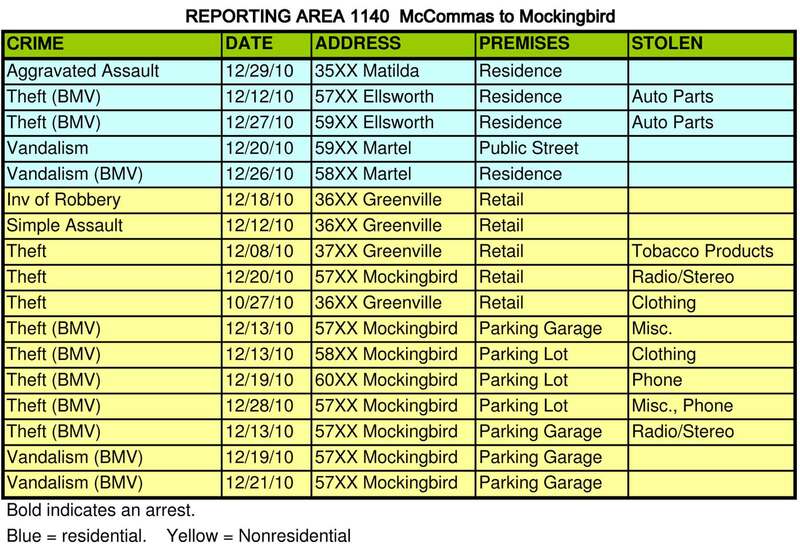 BMVs would have been down were it not for 5 car break-ins that occurred at in the parking garage under 24-Hour Fitness. This garage has persistently been a magnet for theives, so try to park on top if possible when you go there. Our ENP officer was on patrol on Christmas Day when a neighbor on Prospect flagged him down to report a suspicious person. (Yes, you read that right, our patrol officer was working for us on Christmas Day…) The tip paid off. Officer Keith called in on-duty support and they caught the guy red-handed breaking into a home. The burglar was affiliated with the “East Side Homeboys” gang and had been convicted of a previous burglary charge as recently as March 2009. Hopefully, they’ll put him away a little longer this time. Thank you to the resident who provided the tip and thanks to all of you who contribute to the ENP program. The Planning Commission (CPC) voted to recommend the Lowest Greenville PD proposal to the City Council. The vote was unanimous among the members present, one member absent. A large part of the surrounding neighbors cast votes in favor. I don’t have the actual count, but it appeared to be above 70% in favor. And numerous emails to CPC members from neighborhood residents helped as well. The next step will be a vote at City Council scheduled for January 26th. At last week’s quarterly Crime Summit, DPD released their numbers for the entire Central Division. Our area, which is Sector 140, covers the entire Lower Greenville area, not just the LGNA area. They report that violent crime was down 31% for the area: Robberies were down 40% and Aggravated Assaults down 14%. Property Crime were down 18%, but most of those gains were in shoplifting and business burglaries. Home burglaries were down 6% and car break-ins up just slightly by 1%. Next Lowest Greenville PD Passes, Unanimously!